The Colosseum is a must-visit on any trip to Rome, but the crowds of tourists and the lengthy queues in searing summer heat can make even the biggest history buff stay in bed. Which is why you want to wait until dark – no lines, a few dozen other tourists, and the opportunity to walk the shadowy tunnels under the Colosseum floor and get a ‘behind the scenes’ look at what was once the greatest, and most gruesome, show on earth. Even if you know nothing about cars, there is something that stirs inside you when you see an antique Fiat 500. You are transported to a time of old-world glamour, Italian movie stars and La Dolce Vita. It also helps if your car is bright pink, super cute and called ‘Sophia Loren’! 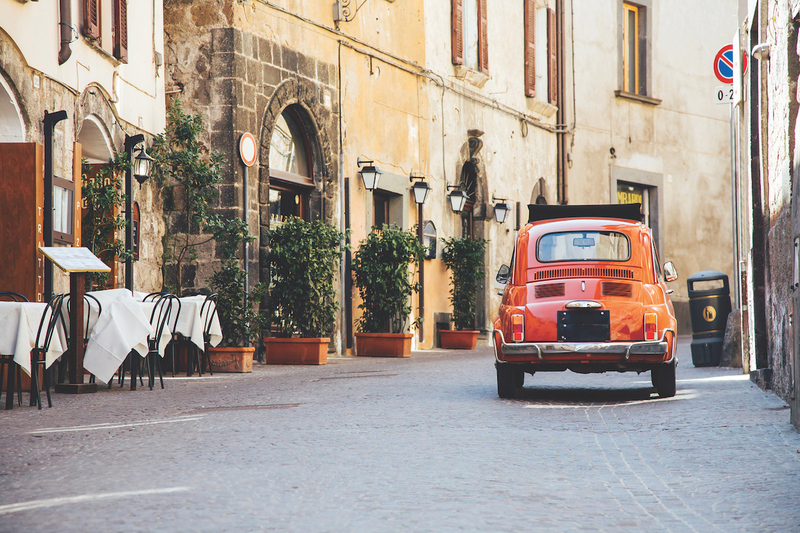 Rome is big, and when the sun is high in the sky, there is no better way to see the city than with the top open on your vintage Fiat 500 while whizzing through busy traffic. Your guide, Alvise, can take the wheel, or you can drive yourself, but on the Hidden Gems tour you will find yourself well away from the usual tourist haunts. Quintessentially Italian, as if he has just stepped out of a Fellini film, Alvise will regale you with tales of ‘blue gold’, the origins of Santa Claus and the exploits of the Knights of Malta at the secret stops along the tour. You will never think of Rome the same way again. Opened in 1963 on the highest hill in Rome, Monte Mario, it doesn’t get more opulent than the Rome Cavalieri. Dominated by gold and marble, the hotel is overflowing with priceless paintings, tapestries and sculptures, including three of Tiepolo’s most important masterpieces. However, it’s the incredible 180-degree sunset views of Rome and Vatican City that will keep you coming back. A tranquil oasis that is home to the city’s only restaurant with three Michelin stars, La Pergola. 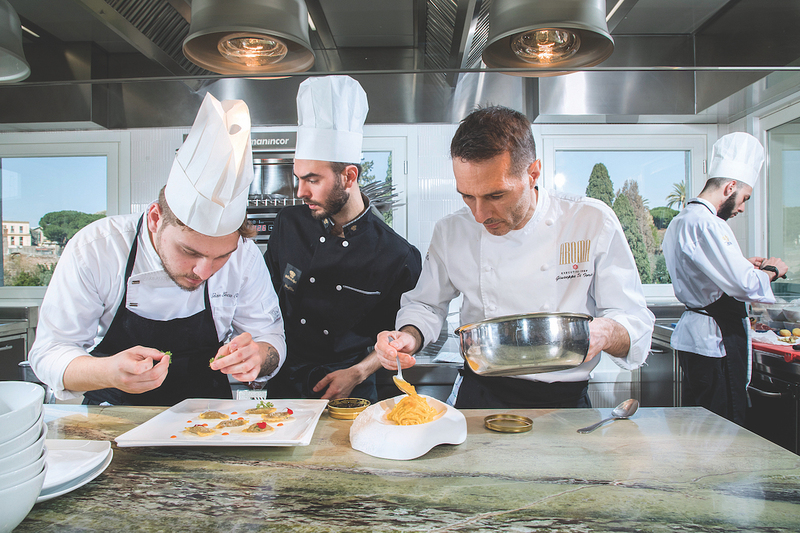 In 2018, the hotel began offering complimentary suite experiences, including a four-hour Culinary Journey tour or a private visit to the Vatican Gardens. Located in the heart of the Eternal City, this recently renovated hotel was opened in 1889 and is only three minutes from the Spanish Steps. Now part of the Dorchester Collection, the restrained decor creates a relaxed luxury, and the 98 newly designed rooms are spacious with a fresh, modern and elegant feel – landing it with the crown of Forbes Travel Guide Five Star award in 2019. On the rooftop, you will find two restaurants serving delicious Roman fare, one with a Michelin star, and both with panoramic views of the city. And in the basement, is the only spa in Europe to feature treatments from the famed skincare guru Sonya Dakar. If you are after a more intimate experience, you can’t go past this retro boutique hotel that is housed in what was once Rome’s school of architecture. Have your pick of 23 double rooms and seven suites all styled with mid-century furniture and an eye on chic design. Located minutes from Rome’s best shopping streets, you can fortify yourself over breakfast at J.K. Café, and end your day with cocktails in the charming library. Last year, famed 100-year-old Italian luxury department store La Rinascente finally opened an outlet in Rome, and it was quickly proclaimed the best department store in the world. Just a few steps from the world-renowned Trevi Fountain, the 11-year-long renovation was inspired by ancient Roman architecture. History and commerce have never been far apart in Rome, and this is most prominently seen in the La Rinascente basement. Here, you can shop for Italian leather goods and iPads alongside the still functioning Aqua Virgo aqueduct that Emperor Augustus inaugurated in 19 BCE. Jump forward from ancient times to the Roaring 20s at this small, dimly lit bar hidden down an unremarkable Roman alleyway. But, before you can sip a Tom Collins or margarita while draped casually on a leather couch, you will need to decode the entry password, which changes frequently, by searching for a hidden question on the bar’s website – happy hunting! Cambiamenti Restaurant for its delicious food and informal, familiar atmosphere. Best place for a business meeting? I have most of my business meetings at Aroma Bistro, located on the rooftop terrace of Palazzo Manfredi. The Bistro has amazing views over Domus Aurea and the Oppian Hill, and has a more casual atmosphere than Aroma Restaurant. I love all barolos. When it comes to white, my favourite one is Gaia & Rey, a chardonnay from the Langhe area of Italy. Best place for foodie inspiration? My family’s kitchen – my mum and my dad love cooking together. There are plenty of Michelin stars floating around Rome, but there is nowhere quite like Aroma. The minute you arrive on the rooftop terrace of the Palazzo Manfredi hotel, you will be entirely captivated by the unobstructed view of the magnificent Colosseum – a luxury you will share with only 27 other diners. 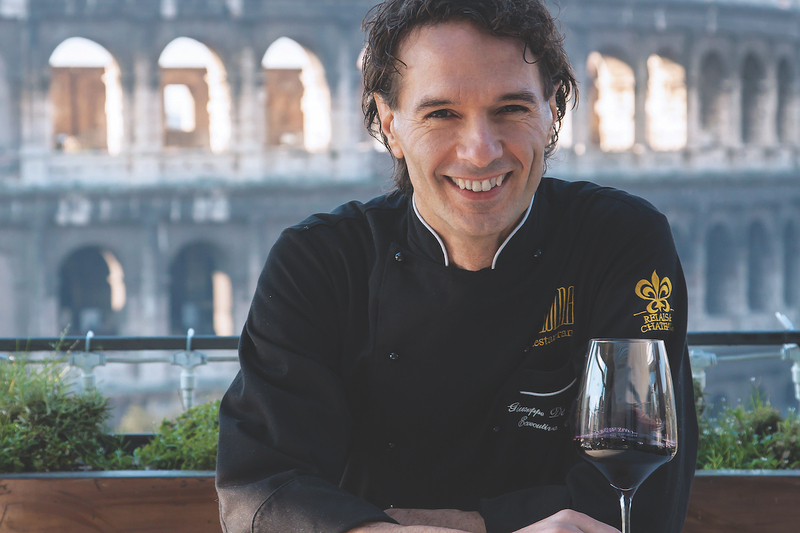 Luckily, Executive Chef Giuseppe Di Iorio knows how to hold his own with one of the most iconic buildings in the world. He draws your attention back to the table with sophisticated fare such as confit crab salad with mango rubra sauce, and tagliatelle with duck ragù and beans flavoured with cardamom. Go for the view, but stay for the braised pigeon. Cristina Bowerman, Rome’s only female Michelin-starred chef, is not one to blend into the crowd, and her brave and bold cuisine stands out among the taditional trattorias that sit alongside her restaurant on the cobblestone streets of Trastevere. Inside the modern, two-storey space with a rustic decor, Bowerman serves up seaweed macarons, beef tartare with passionfruit mayonnaise and wasabi ice cream. You can opt for the à la carte menu, a ‘traditional’ tasting menu, or, for the truly adventurous, the ‘around the world and back’ creative tasting of nine courses. Top 3 places to eat and drink? Heinz Beck’s La Pergola here in the hotel – it is a temple of gastronomy famous around the world. Pierluigi is an 80-year-old fish restaurant near the Tiber, and Taverna Trilussa is a charming Italian bistro serving old Roman-style dishes in Trastevere, the Jewish quarter. We recently developed regional experiences for guests, including truffle hunting in Umbria, wine tasting near Orvieto, and visits to the ancient cities of Pompeii or Paestum – they are all easy distances from Rome. I studied archaeology, so I love to point guests to places where you can see all the different layers and levels of Rome. 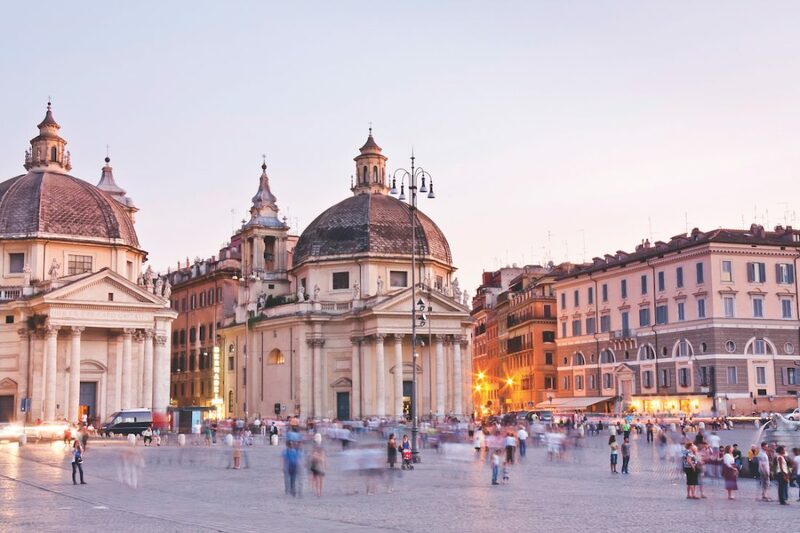 I often recommend the Basilica of Saint Clement, and Piazza Mattei is one of the most romantic squares in the city. It is a very romantic city. Even after 20 years of living here, I catch a glimpse of the Colosseum or the Pantheon and have a ‘wow’ moment.